Paean A Man's Scarf is the latest creation that I have embarked. 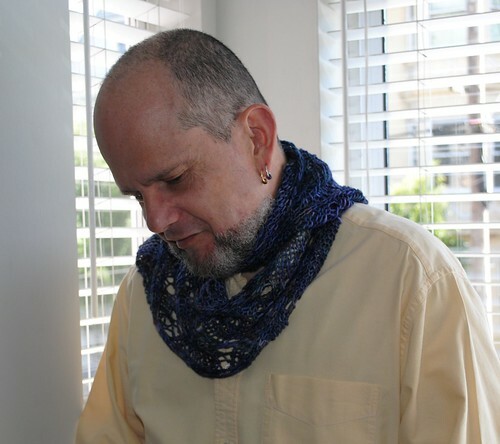 It is a light Lace Scarf for a man that with the right colors will make a great addition to your wardrobe. It gets made in a few days and it blocks fantastic. This is another view of the scarf. It is made with less than one skein of Malabrigo Superwash Worsted Weight Merino, around 70 grams of the 100 grams skein. The skein is about 210 yards per 100 grams. This scarf is light and warm at the same time and can be kept inside your shirt without much bulk, yet give you the warmth around your neck and chest that you require when the temps drop a bit. I can honestly tell you that I had no idea how beautifully it was going to block, but then again it is malabrigo. You can purchase the pattern by clicking on the Buy Now Button Below and it will take you directly to paypal. There are three more patterns coming out in the next few weeks. 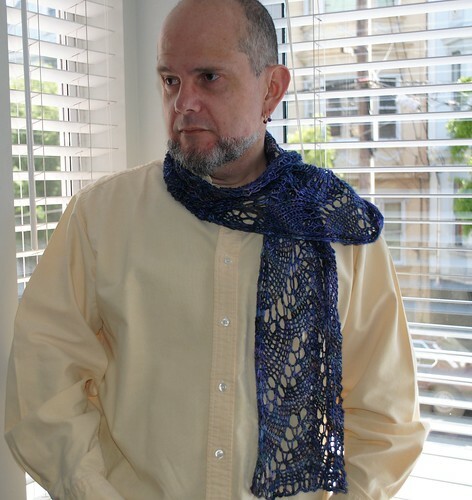 Next week there will be a Man's Shawl Pattern by me that you are going to love as well. I hope you like it and thanks for stopping by!